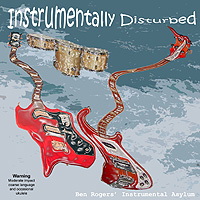 mwe3.com: The new album Ben Rogers' Instrumental Asylum, Instrumentally Disturbed is a fantastic instrumental rock guitar album. How would you compare the approach and end results on the new 2010 album compared to your 2007 album, Reverb Rehab? Ben Rogers: Thanks Robert - I'm pleased you like it! Although we were very happy with Reverb Rehab and quite flattered by the reviews, our approach was to "raise the bar" with the new album. The approach to recording Instrumentally Disturbed was similar to Reverb Rehab - some tracks were recorded live in our studio without overdubs, while with others we focused on getting the rhythm section down and then overdubbed guitars later. Denis had more involvement in engineering the recording of the drums this time, and we spent longer on mixing. I think this shows in the end result, and also I think we're developing our sound as a band. There's more original material on this album too - only three of the tracks are covers. mwe3.com: How would you describe the musical chemistry between drummer Denis Close and bass player Nikki Scarlett and how does Al Kash fit into the equation? 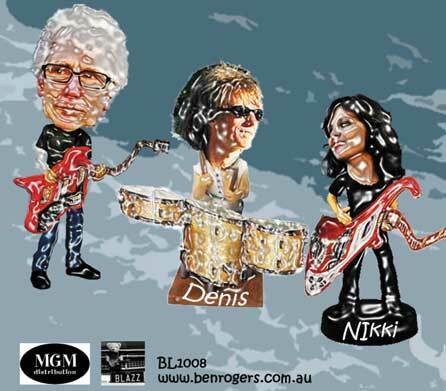 Ben: There's a great musical chemistry between Nikki and Denis - the way they feel the "pulse" in the same way provides a solid bed, so I can just enjoy playing the guitar without needing to think about holding down the tempo or driving the rhythm - it's just there! It's similar with Al Kash too, although he's a very different drummer from Denis - there's a real chemistry when Al and Nikki play together. Nikki Scarlett: Although Al's style is quite different from Denis, they both sit in the same place on the beat. Ben: Al and I played and recorded together in Perth (Western Australia) many years ago, before Al relocated back to the US. We've kept in touch over the years, and Nikki and I have traveled to the US a couple of times to play some shows together with Al. In 2008 Al was back in Australia briefly, and we took the opportunity then to record two tracks with him for Instrumentally Disturbed. mwe3.com: On Reverb Rehab you blended in some choice cover tunes including the Beatles' classic "Strawberry Fields Forever" and on Instrumentally Disturbed I was amazed at your good taste in that you selected an old girl group number "Tell Him" to play as an instrumental. How did you end up choosing that song? I remember buying the 45 rpm single (on Laurie Records? no picture sleeve) back in 1962 or early '63? What about that song and what do you look for in a cover track? Was it big in Australia? And are there other songs stand out as possible future covers to record? Nikki: There's no particular rhyme or reason with choice of material, other than one of us just liking a song. For example, the opening track on Reverb Rehab - Mr P.C. - was suggested by Denis. I'd always liked Mr P.C. - it's a fabulous tune written by a jazz giant, John Coltrane, in honor of one of my bass heroes, Paul Chambers. At first Ben wasn't sure how to make it work as a guitar instrumental, but when we started playing it, it just took on a life of its own. Ben: If one of us likes a song we'll just try it as an instrumental. They don't all work out, for example I really wanted to do a version of Neil Young's "Shock & Awe", but when we tried it, it just sounded like the song without the vocals! "Tell Him" was a hit in Australia, and I've always liked it. It's a well-constructed tune with three sections, and when we played it faster and "garage style" it just seemed to work. As far as future covers, we don't have anything in particular lined up, but nothing is sacred! mwe3.com: Your version for "La Mer" is quite majestic and unusual. Most people know that song "Beyond The Sea" as a vocal...it's also slightly derivative of "Perfidia" no? Anyway your version is quite unique and special. Why and what about that song really stands out for you? Ben: I'm glad you like our version. Once again it's a strong melody, with a common chord progression somewhat similar to Perfidia, as you say. However it's a deceptive tune, as the melody moves through three keys, making it quite interesting to play. I first heard the song as Bobby Darin's "Beyond The Sea", but it was a 1949 version by Django Reinhardt that really endeared the song to me. Of course our version is nothing like Django's though we've slowed it down and dirtied it up a bit. mwe3.com: What songs stand out as favorites of yours on the new CD? Denis Close: The first track - "Fencing". It's fun to paint an aural picture, and that's what this tune is to me. Ben: I think my favorite is "Fencing" too. This track had a difficult birth. It was one of those tunes that took a while to evolve, but we worked at it for quite a while to get it sounding right, and we're really happy with the end result. Nikki: My favorite is "Blues on a Borrowed Guitar". I'm a simple soul and like the big ballsy blues sound of this track! mwe3.com: You cite the "guitar noir" sound as a big influence. How would you describe the concept of "guitar noir" and its practitioners and how does it fit into the Ben Rogers Instrumental Asylum guitar instro sound? Ben: Guitar noir is a term borrowed and adapted from cinema - the dramatic mood of the classic film noir concept, with lots of dark unexplored corners and melodramatic crime themes. As far as describing our sound, we didn't set out to create a particular band sound, and so we weren't sure how to describe it initially. 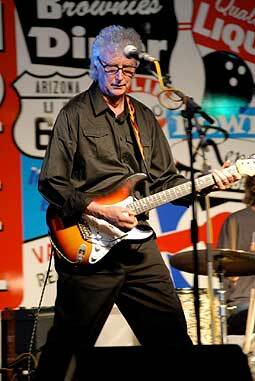 In some cases we've used descriptions that others have applied to our music, for example "like Hank Marvin on acid!". We used the term "surf guitar" because that's a reasonably well understood category, but we never intended to recreate the classic surf sound, which is based on a clean (i.e. - not overdriven) guitar usually played through a Fender Reverb Tank, with a second guitar or keyboards in the band to fill out the sound. Our guitar sound is more distorted than true surf guitar. mwe3.com: Current Atlantics guitarist Martin Cilia plays on the new album. How would you describe Martin's contribution on the new album as well as his influence on the current guitar scene. Also, how big an influence were The Atlantics on you and the whole Australian guitar scene back in the '60s? Ben: The Atlantics' tune Bombora was a No.1 hit in Australia, and as I had taken up the guitar a year or so before it was released it was naturally an influence on me. Another significant influence for me was Dave Bridge, the first guitarist I ever saw live in concert. He had several hits in Australia, including "The Swan", which he adapted from Tchaikovsky's Swan Lake ballet. We covered one of Dave Bridge's tunes, "Bondi Stomp" on our last album. The Denvermen were another early 60s Aussie group that had a hit with an instrumental - their tune "Surfside" made it to No. 1. 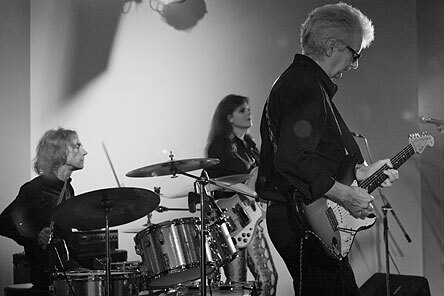 Other US hits such as "Pipeline" and "Wipeout" as well as the hits of The Shadows and The Ventures, were part of every budding guitarist's repertoire at the time. We met Martin Cilia a couple of years ago at an instrumental guitar festival, and got together for a jam shortly afterwards. We found our playing complemented each other's and we thought it would be nice for Martin to feature on a couple of tracks on the album. He's a great exponent of the true surf guitar style, and brings another layer to the sound of Instrumental Asylum. mwe3.com: How would you compare the influences of Django Reinhardt, Les Paul and Hank Marvin on your own playing? Ben: I was somewhat isolated from a lot of music in my youth, living out in the country and relying on popular radio or my older brother's record collection which was mostly The Ventures. Chronologically Hank was an early influence, as The Shadows were very popular in Australia. I didn't discover Django until much later, nor did I hear anything of Les Paul during my formative years. However when I did hear and begin to appreciate Django I spent a number of years immersing myself in his music to the exclusion of most other styles, and this has influenced my playing. I still play the Gypsy Jazz style as a side project with a violinist and with Nikki on double bass. mwe3.com: Can you let the readers know what guitars and pedals you're using on the Instrumentally Disturbed CD? Any current favorite guitars and/or new/vintage gear and the current strings you'd like to discuss or mention? Ben: While the last album was primarily Fender Strat sounds, Instrumentally Disturbed features a recent acquisition - a Gibson Johnny A. This is a small hollow body with 57 style humbuckers and a Bigsby tremolo, and is a very versatile guitar with a beautiful rich tone. It produces a big sound, especially through my Mesa Boogie (an 80s Series III Simul-class) on overdrive setting. This is most evident on the track "Anouman", which incidentally is an arrangement of a Django composition. I rely on the Mesa Boogie for overdrive, and run a line out from this through a Boss Giga-Delay pedal into a 1961 Fender Vibrolux. I don't use any other pedals. The Strat sound still features on some tracks. I have a couple of reissues - a Fender Custom Shop 1960 NOS and a 1962 reissue made in the late 80s. 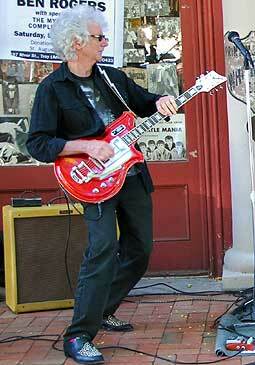 For one track - "Shfuffle" - I was aiming for that big Duane Eddy sound, and for this I used my 1963 Guild Thunderbird. mwe3.com: Can you say something about what guitarists and instrumental groups and/or rock and pop albums, artists and singers you're currently listening to? Denis: Currently listening to Dom Mariani and the Majestic Kelp (from Perth, Western Australia), and The Aqua Velvets. Ben: Not a lot of current releases, although out of curiosity I had to check out Santana's "Guitar Heaven" to see what he'd done with some of the classic rock standards. 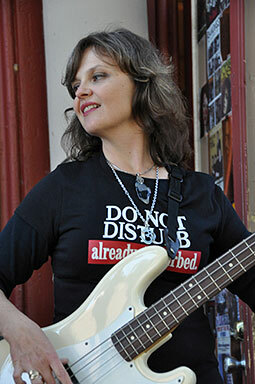 Acts that I've seen live recently include Jeff Beck, The Break, and Don Walker and the Suave F**ks. I bought Yawning Man's Rock Formations a while back, and I still enjoy that album, especially in the car on a long drive. Other favorites include JJ Cale and Danny Gatton, but I still listen to Django more than any other guitarist. Nikki: My long time favorites would be Richard Thompson, Nick Drake, and Australia's greatest songwriter - Paul Kelly. mwe3.com: Can you let us in on plans regarding any recording and or performances from Ben Rogers' Instrumental Asylum coming in the future? Ben: For now we're focused on promoting Instrumentally Disturbed - initially with live performances within Australia, but we also looking for possibilities further afield. Our approach to recording is based on a desire to keep expanding within the tradition of instrumental rock guitar. There's always more songs to write and record - it's like a disease!